Patrick Altès was a Leverhulme Artist in Residence working with the Francophone Africa cluster in 2012/13. Since then, he has been exhibiting works inspired by the residency around the world, including as part of Caravan, an international and interreligious peacebuilding arts non-profit. His work is currently on show at the Musée d’Art Moderne Algérien as part of the 7th edition of the FIAC, the International Festival of Contemporary Art. Patrick Altès explains below the genesis of his new work, Les Riches Heures, selected by the FIAC. My reaction to the title of the show and what it represents has been to freeze a frame, create a timeless moment stripped of its historical significance as well as to refer to the auroral or a-historic time marking the origin and creation of cultures and civilizations. The constant ebb and flow of civilizations around the Mediterranean shores over the millennia has always fascinated me. 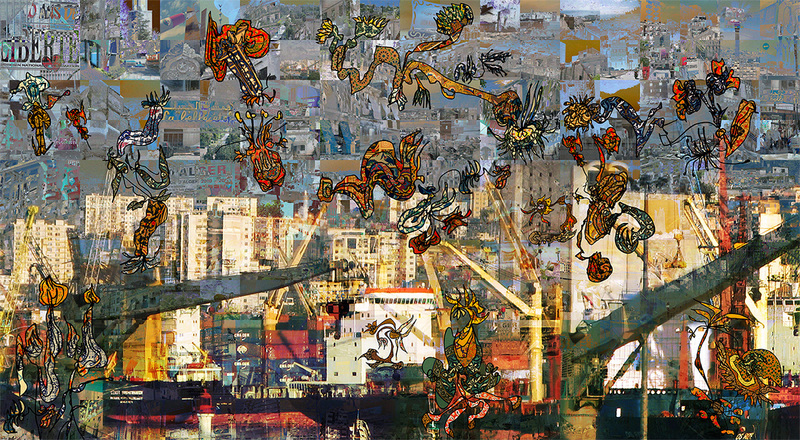 In this context, the many facets of Algiers, “A huge geological animal that constituted the city and its thousand streets” (Kamel Daoud, Meursault, La contre-enquête), “On a happy shore and under the light of the first morning of the world” (Albert Camus, Le Premier Homme), could only but irresistibly attract me. In Les Riches Heures, the city is apparently open, candid and exuberant but in fact secret, proud and reserved. Civilizations intersect, intertwine and challenge each other. The Bay of Algiers suggests an inherent sweetness of life while the harbor imposes its intrinsic brutality. The multitudes of photos used in this work are the result of long random walks through to city as well as chance meeting with its inhabitants. They intertwine into a rich tapestry of civilizational contrasts, juxtapositions, interpretations and mirroring reflections, symbolic of the city’s identity. Intended as a hymn to life and hope, the work is chaotic and fertile, rich and sensual at once. 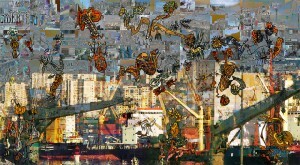 Imaginary drawings of flowers are superimposed on the kaleidoscope of the city. These flowers, adorned with oriental decorative motifs, evoke the fertile ground for change as well as the power of the people, fragile, fleeting and generous. Below the table, on the floor, an accumulation of dead flowers and bouquets refers to the inevitable passage of civilizations and open more personal narratives. Les Riches Heures, a panoramic representation of the city, is also a personal and memorial representation of Algiers. Furthermore, it explores the notion of the third dimension in a two-dimensional work, which discards perspective and refers to the color theory of Paul Klee. The narrative conveys a talismanic, magical value. It crystallizes a reflection on origins and its relationship with the concept of identity while affirming the eclectic and humanistic value of the work.